One of the most frequent Mac OS X feature requests I see from former Windows users—and one that’s also popular among longtime Mac users—is the ability to quickly view photos and images in the Finder, without having to launch a separate application. The Finder lets you view a slideshow of selected images, but what you can actually do with those images while viewing them is limited. Over the past few years, I’ve covered a number of add-ons to OS X that provide such functionality. For example, QuickImage CM lets you view (and, to some extent, edit) an image by right/control-clicking on the image and choosing View Image from the resulting contextual menu. More recently, I covered MilkyWay, which pops up a small preview window for any image clicked in the Finder. If you choose Show mode, the image will be displayed, full-size, in a viewing window. (If multiple images were selected, only a single image will be displayed at once; you can use the arrow keys to cycle through the images.) Pressing the T key brings up PicturePop’s toolbar, which lets you perform basic viewing-related actions such as zooming in or out and rotating. Pressing the F key switches to full-screen mode. But you can also access a number of more powerful features by pressing the A key or clicking the Action (gear-like) icon in the toolbar. This brings up two additional tool palettes. 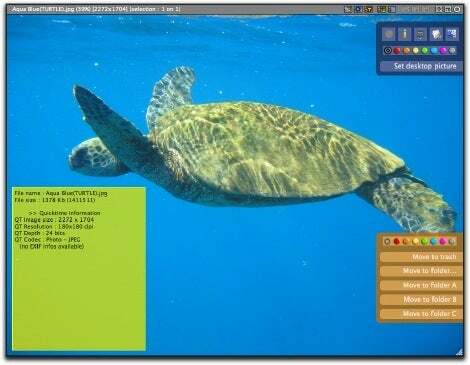 The first, dark blue, includes options that can be applied to the current image: you can get info about the image, move it to the Trash, open it in its default application, view it in the Finder, or mark it for further action. 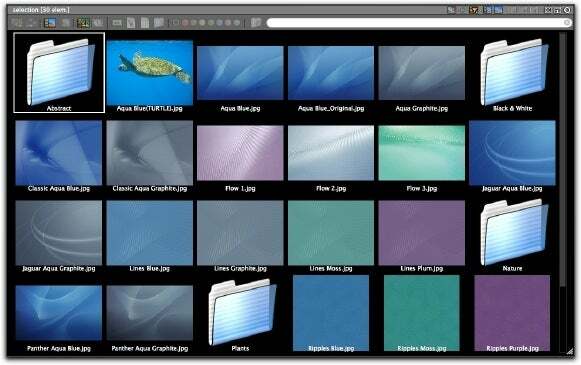 You can also apply a colored Finder label to the image file, or set the image as your Desktop picture. The second palette, orange, lets you perform actions on all marked files: move them to the Trash, move them to a folder you navigate to, or move them to one of three folders you designate in PicturePop’s preferences. This latter feature makes PicturePop useful as a way to quickly scan a folder of images to keep or delete, much like PhotoReviewer, which I reviewed a couple years back. For example, you could create a folder called Keep , assign it to one of PicturePop’s folder buttons, and then browse a folder of images, deciding along the way what to do with each. By marking (with the blue palette) those images you want to keep, at the end of your browsing session, clicking the appropriate “Move to folder” button would move all marked images to that folder. A third palette, featuring PDF-viewing options, appears only when viewing a PDF document. PicturePop’s Browse mode is useful when you’ve selected a group of images or a folder containing several images. 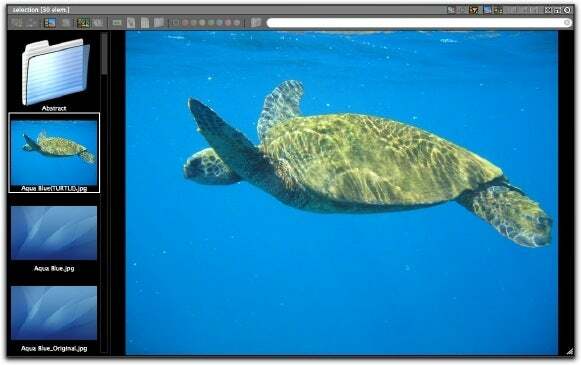 By pressing the Tab key, you can cycle through one of three ways to browse those images: the standard one-image-at-a-time view, a “contact sheet” view that displays smaller versions of all the images in a grid, or a browser view with a list of the images in a pane to the left and the selected image displayed to the right. (The list of images can be switched between file names and thumbnails.) 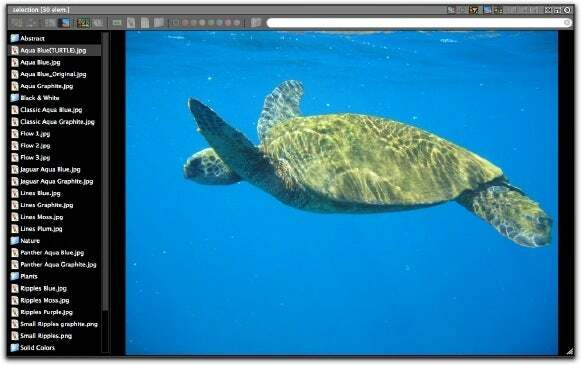 You can use the arrow keys to move through images; if you have a mouse with a scroll wheel—or a newer Apple notebook with a scrolling trackpad—you can also scroll through the images. PicturePop’s toolbar and palettes are also available in Browse mode, via the same keyboard shortcuts. By pressing the D key—for “diaporama,” according to the developer—you can view a group of images as a slide show. One thing I like about PicturePop Pro is that its windows, although not really Finder windows, act like Finder windows; they can be positioned in front of or behind other Finder windows, and they shows up in the Finder’s Window menu. You can even open multiple PicturePop Pro windows simultaneously. 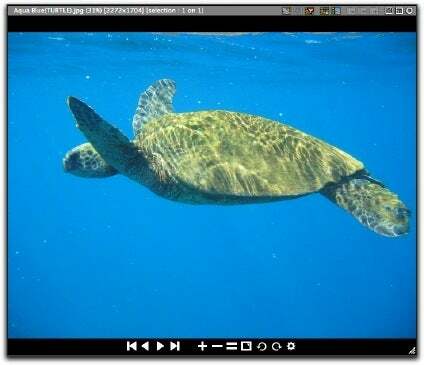 And because PicturePop supports all QuickTime-supported formats, you can even use it to quickly preview QuickTime movies. The current version of PicturePop Pro is a preview of the first Intel-native release, so it’s got some bugs and known problems. For example, it occasionally crashes the Finder when I’ve been doing a lot of image-poking and -prodding. And it’s also missing a few features promised for the final release—despite including buttons for them—such as the ability to quickly search through a folder of images by image name. But the preview version has been working surprisingly well for me overall—good enough to take a quick look at images. I’m looking forward to a final version. 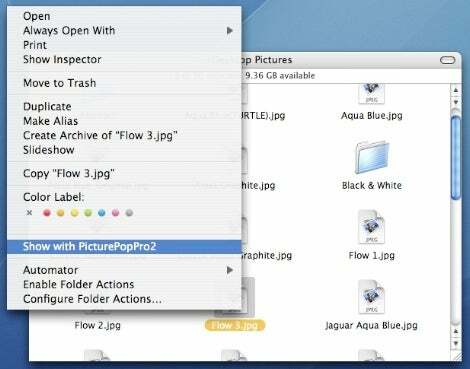 PicturePop Pro works with Mac OS X 10.3.9 and later and is a Universal binary.